As the word itself suggests, Androgynous means anything that gives the appearance of both the genders, i.e., male and female. As the World is modernizing and the thought process of people is getting progressive, a huge change in the fashion world is also witnessed. To abolish inequality between genders Androgynous haircuts are pushing great pressure and showcasing the right message to society. Androgynous haircuts are getting very popular these days. The style is initiated by celebrities to try some unconventional look and experience how it feels to follow some styling of another gender. Those who want to make their own style statement that comprises of the toughness of masculinity and the grace of feminism, androgynous haircuts has lot more variations for you. If you have such futuristic taste, this style will surely attract you. This hairstyle is an excellent way of breaking gender norms and unnecessary pressure on youth. Androgyny haircut is the latest trend in the fashion world and has got fair popularity in such a short period. This style is creative and makes you look entirely different and keeps no bias between both the genders. It serves both males and females equally with a unique and stylish look. This hairstyle is bold with a soft touch. The hairstyle cut that is masculine from the back and has a girly soft touch at the front. This is a unisex haircut that might look more apt on girls because of the color combination and long hair at the front covering the forehead. This style is better defining what androgynous hairstyles are all about as it is showing the perfect blend of both manly haircut with a soft wavy hair at the front. The hairstyle compliments best with baggy t-shirts or shirts or any loose outfit to bring a cool effect. Androgynous haircuts usually consist of shorter hair. For long hair, there are fewer Androgynous styles because long hair is associated with females and this style is intended to bring a more gender equality approach, an unconventional style or mullet fashioned hair. This hairstyle has everything from bangs to shorter hair at the back along with a thin layer of long hair at the back. This is a unique style actually. This style looks great with oval-shaped faces and can be paired with funky and casual clothes. The ultimate masculine look to make the woman look harder and more robust. The style requires black hair with a sharp cut. The side hair is shaved with a razor to create a complementary look for the longer spikes. The unique touch is wavy side of the spikes. This is a most comfortable hairstyle for a woman to carry that lets you stay hassle free and carefree all the time. Also, the gelled up hair streaks look fresh and brings a nice texture to the style. This style suits round and triangular faces and can be carried off well with all types of outfits. The balayage of gorgeous burgundy and brown shade is looking really great and complimenting this Androgynous hairstyle perfectly. This is one of the Androgynous hairstyles that is styled with longer hair. The looks of this style are more girly and masculine but the blunt front bangs with no curves are adding a masculine touch. The waves are adding more style and making the style more effortless and lively. This is a style that makes you look bold and confident and let you flaunt your carefree and frolicsome attitude. The very short hairdo is very dauntless, fearless and adventurous one to carry wholeheartedly. The hair color is playing the significant role in making the hairstyle unique and stylish. The color is a perfect balayage of white and black combination to create a grey effect, and the sprinkle of extremely light pink shade is something that is making the hair look simply outstanding. Along with very short hair at the top, the sides are shaved with a bald effect. It is the coolest style to carry in hot sunny days. To bring a tougher look for females with style and grace, this hairstyle is the perfectly designed and compiled. The hair color is naturally black, and the hair texture is ordinary. The partially Matt and partially shiny hair is styled with soft waves to bring more volume and add an effortless styling to the look. This type of hair looks the best on sports persons and athletes as well as the gym lovers. The beautiful cottony white hair with smooth and Matt finish is the hair type that everyone wishes to have. This is the androgynous hairstyle with a boy cut styled appearance. The longer side locks are kept just to keep the look a bit more on the girly side. The side swept bangs is looking great and adding style and cool effect to the look. The black hat and cute tiny yellow flowers are working as a hair accessory. This looks great with casual and funky clothes especially a pair of denim and a cool and baggy cotton shirt. 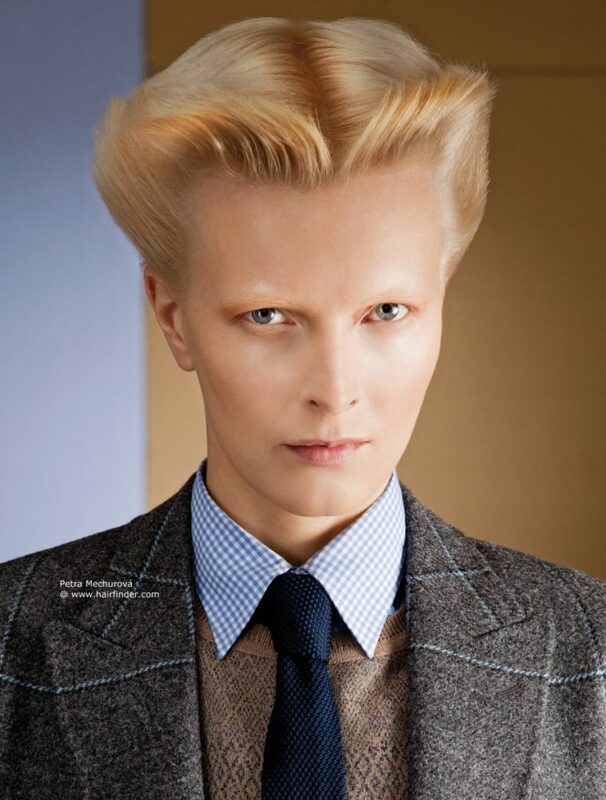 The unusual and extraordinary androgynous hairstyle that simply makes you look unconventional and dynamic. This is one of the dauntless and courageous looks to carry off. The masculine part of this hairstyle is the short hair with razor side and back. The feminism part is its unique rock and rolled up cyclone like curl. The cyclone look is managed and gripped with the use of hair gel and spray. This is an artistic look that belongs to people dealing in a creative profession. This hairstyle revolves around playful colors. The beauty of this look is the combination and placement of beautiful colors that are making the hairstyle look bright, lively, energetic and exceptionally cool. The short hair with a manly cut is twisted and turned into a vibrant hairdo with the cool matt finish, and fluffy hair and the front hair is colored with multi shades to add beauty and vastness to this look. The front hair is kept longer and colorful whereas the back hair is kept jet black and short. An androgynous hairstyle with much long hair for those who are not able to collect that big heart to cut off their precious long hair. This style is very easy to make and much comfortable to carry off the whole day with utmost style and glamour. In this hairstyle, you need a golden brown shade of hair with glossy and shiny radiance and smooth texture. The hairstyle requires just gathering up all the hair and making tying them up to make a beautiful bun at the top. Beautify the bun with side strands, and you are good to go. This is one of the coolest androgynous hairstyle look. The hair looks quite natural with magnificent glossy and smooth texture and straightness of each hair strand. The hairstyle just requires a free hand stylish and sharp chop cut with a touch of pixie cut to give each and every hair strand a defined and detailed look and make them look nicely textured and denser. The front hair with sharp cuts is giving a masculine look and brings a slight toughness to the appearance. The creatively designed hairstyle where the front bangs are kept longer and the rest of the hair is cut with a pixie touch. In this style, you can see the front hair kept longer with side swept bangs covering one the eye completely to create a suspense look. The rest of the hair absolutely short with a manly haircut. This is a funky style to carry off and is apt for those who want to have a hippie touch look. It is an eye catchy style and makes you look like a fashionable diva. 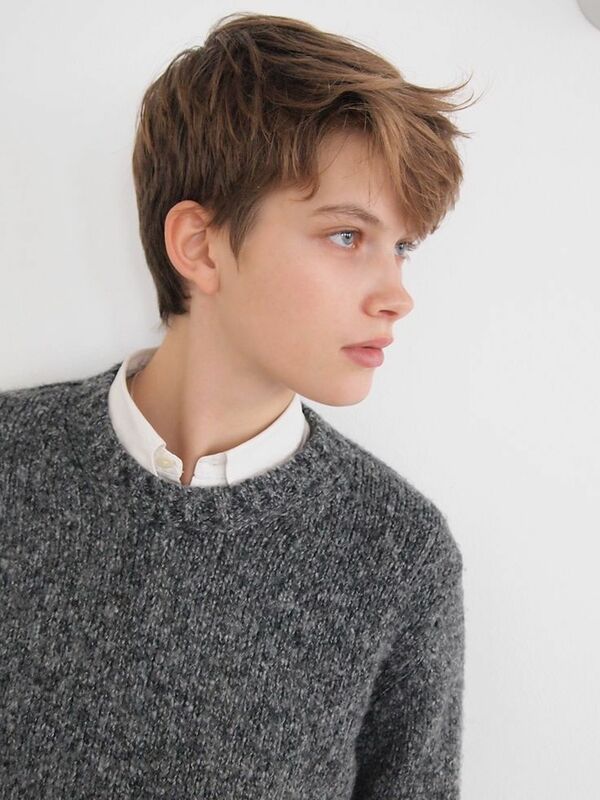 One of the cutest look in androgynous hairstyles. The perfect balayage of brown and golden shades looks so natural and eye soothing and complimenting the hair cut perfectly. The hairstyle is a simple yet very graceful one. The hairstyle includes combing up of hair with a slight puff to create a pompadour look, and the few hair strands are styled to create few spiky streaks to add texture to the hairstyle. It looks great with formal outfits and light to make up. This is a most different hairstyle with a unique shade of hair color. This style is for sure carrying a masculine touch with shorter side locks and back hair but the side fluffy Mohawk with a bit longer hair is making it look softer. To attain this hairstyle you need to have the balayage of golden shade with such fine and smooth textured hair. This hairstyle is ageless and can be carried off well by all age groups depending upon their face cuts and personalities. The sharply styled hair makes the facial features look more prominent. The jet black shiny hair is cut very short to create a masculine look. The girls who like to kept their hair shirt and stay comfortable all the time with no hassle of setting the long hair and managing them again and again. The short hair is combed up to back keeping both the sides’ razor to create a contrasting effect. It is best suitable for those whose job requires them to look a bit serious and focused. It looks best with a pair of pant and shirt or casual top. This is an artistic design created by professionals to add on some twists and turns to the hairstyle and look more playful. The hair color to make a good hairstyle plays an important role. Here also you can see the fantastic blend of colors making the hairdo more frolicsome and lively. The use of blonde color to highlight and the balayage of brown and grey color with a radiant finish looks glamorous with this style. The pixie cut is giving the style more detailing and volume whereas cornrow braids is giving it multi texture. This androgynous style is hard to differentiate between its combination of masculine feature and feminine feature. The hairstyle is looking so graceful on this girl, but it can be carried off well as it is on a male also. Only the curved side locks are adding some feminism to it. The style looks great with Mohawk cut along with some gelled up spikes. This is efficient in highlighting your beautiful facial features. The super cool style to carry off by fun-loving and adventurous gals. This style is all about keeping the hair short, funky, wavy, comb free and effortlessly stylish. This androgynous hairstyle requires just a stylish pixie cut on wavy hair and keeping the hair messy and loose. The hair is combed from back to front to create a cloudy effect. It can be best paired with casual jackets and baggy shirts. This is one of the elegant and sophisticated androgynous hairstyles that can keep you going for all occasions and events with the same style. The hairstyle requires the natural looking hair with a glossy, lustrous radiance and the blend of multi brown shades to create the same effect. The side swept bangs are playing their feminine part and making you look bold, smart, futuristic and flawless. The unusual and stylish hairstyle that makes you look super funky and sassy with all the boldness and courageous personality. This is the style that requires a classic pixie cut with keeping the top hair fairly long and styled from back to front and the sides are shaved to tiny hair. 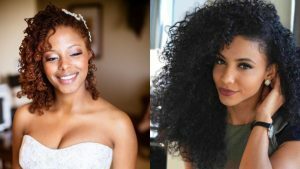 Both the top long hair and side short hair are complimenting each other and doing their best to make the style more creative and stylish. This style is surely one of the most wanted androgynous hairstyles. The gorgeous platinum color with contrasting grey shade is doing a great job here. The look is created by keeping the roots darker and the ends of the hair brighter to create a perfect combination. The hair is styled with pixie cut to add beautiful texture to the style and let the hair scatter all over the head beautifully to create a voluminous look. This style can be best paired with beautiful accessories and all kinds of outfits. 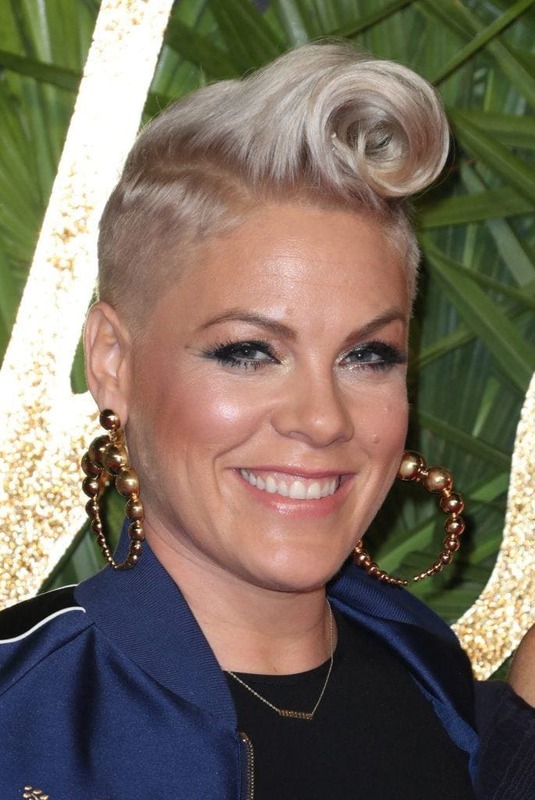 These are the 21 most cool and funky hairstyles for women gathered just for you to give you an extraordinary and cool look defying all gender barriers and societal discrimination. It is a revolutionary style to bring gender fluidity and break the stereotype of men and women hairstyling. So, gals don’t wait and bring a change by choosing these cool hairstyles with great style statement and unconventional look.